BenchmarkPortal recognizes the exceptional efficiency and effectiveness of the EFG by awarding it Certification as a Center of Excellence. The granting of certification is based on a company’s operational metrics, customer satisfaction and agent satisfaction. Contact centers that achieve certification are remarkable in their ability to balance a commitment to service excellence. It is an achievement of distinction. To achieve certification as a Center of Excellence, a company must undergo a rigorous call center benchmarking process, which compares the organization’s operational metrics to those of its peers, using the world's largest database of contact center metrics. During this process, BenchmarkPortal experts audit and verify key data from the contact center applying for certification. “Contact centers that achieve certification are remarkable in their ability to balance a commitment to service excellence. It is an achievement of distinction,” added Belfiore, who has been with the company since 2000. BenchmarkPortal’s founders pioneered the first contact center benchmarking study in 1995. 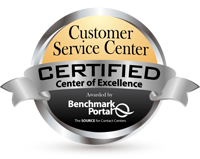 Now custodian of the largest database of contact center metrics in the world, BenchmarkPortal is a leader in certification, training, consulting and research for the customer contact industry. Its team of professionals has gained international recognition for expertise and innovation in best practices. BenchmarkPortal’s mission is to help management optimize the performance of their center in terms of both cost and quality, encourage customer loyalty and build enterprise value. For more information on BenchmarkPortal, call 1-800-214-8929 or visit http://www.BenchmarkPortal.com.